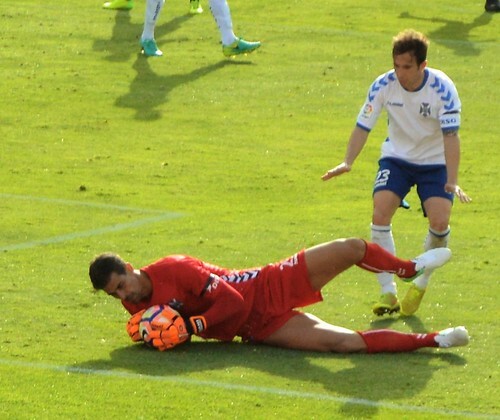 With a 0-1 lead at Cordoba from a first Naranjo goal, a penalty save, and a steady recovery after Luis Perez was sent off, CD Tenerife thought things were looking up. Then in injury time the roof fell in as a 25 metre pile driver made it 1-1 to leave the visitors still looking for their first win. Coach Jose Luis Oltra, back in charge 10 years after weaving his promotion magic, must have thought his bold tactical revamp had reaped its reward but now he knows he can´t rely on any help from Lady Luck. Oltra rung the changes and started with a very fluid defence, Aveldano replaced Carlos Ruiz, and defender Luis Perez played further up with Jorge covering across as a part time right back, a role he performed with some style. Alberto didn´t cope as well with his deep midfield role and extra responsibility to fill in the centre of the defence. The forwards got some early encouragement with Naranjo forcing a corner, and Nano setting up Acosta before the goalie gathered the ball. Jaime Romero was the danger man for Cordoba, but wasted a free shot after 10 minutes. 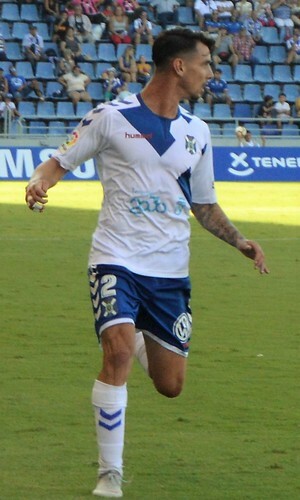 Tenerife produced their first half chance when Nano slipped a pass to Bryan Acosta before the goalie raced out to claim it. There was an air of desperation about Cordoba, sharing the relegation zone with Tenerife, and there was no romantic intent when Quintavilla gripped Naranjo´s hand, it was just to pull him back when he looked like setting off on a goal bound dash. Quezada tried to grab Perez and having failed, dropped to the floor clutching his face, it earned him a free kick and a booking for the Tenerife player. The kick was heading for the visitors goal but Dani Hernandez was decisive and punched the ball clear. It was a sultry night more suited to Tenerife, a water break on the half hour quenched a few thirsts, Jaime was still hungry for a goal and tested Dani with a dipping cross that the keeper handled well. It signalled a mini siege from Cordoba, Alberto half cleared with his head, and Dani turned aside another Jaime effort. 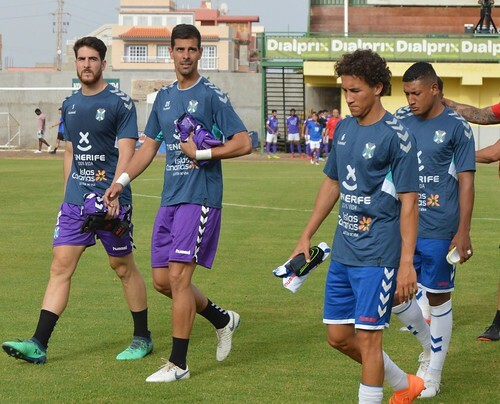 Tenerife had the last word for the first half, Naranjo was flattened by Bambock and hit a long shot free kick that took a deflection before hitting the back of the net for a half time lead. After the break,the home goalie was fortunate to get a second grab at the ball from an Acosta shot as Nano ran in for a possible follow up. The keeper did better when running across his goal mouth to thwart Acosta with a fine one handed save. 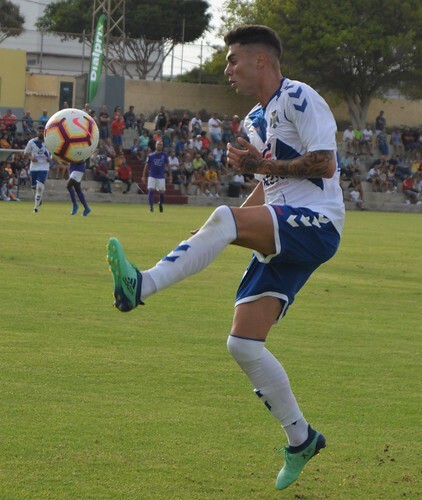 Tenerife suffered a big blow after 60 minutes when a loose Perez tackle got him a second booking and a sending off, Raul Camara came on for Nano to shore up the defence and Cordoba sensed hope for them. Aveldaño blocked Jaime well at the post, and Dani made a great feet and body save from sub Jovanovic. Hector replaced Camille, it would have been nice to see some width introduced through maybe Suso but it was understandable that Oltra wanted to hold on to the win. 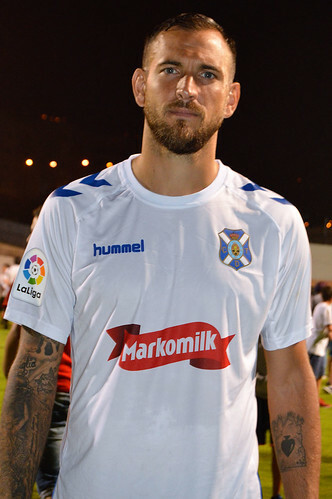 Alfaro had joined the Cordoba attack from the bench, a former big star in Oltra´s golden season with Tenerife, his soft shot showed that the years had caught up with him. Acosta spurned an easy chance to make it 0-2, Naranjo made the run and fed him the ball but his hesitation allowed a defender to get an intercepting foot in. Just six minutes remained when Jorge pushed a Cordoba player over in the box and Jaime stepped up to take the penalty. Dani judged it magnificently and saved with his feet. Still in front and still believing, Tenerife were in injury time when a screaming free kick from Aquado pole axed them, Dani had no chance of stopping it. Alfaro could have made things worse when he broke free but Dani was quick to scoop up the ball. Even the final seconds of the game betrayed Tenerife, a Cordoba defender body charged Alberto to the floor in the box but the ref was unmoved and blew the final whistle.